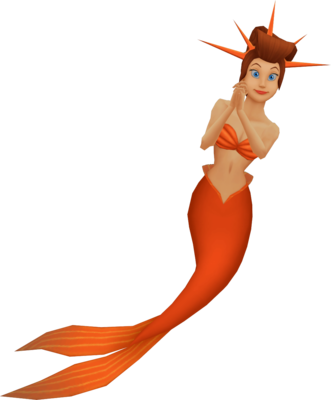 Ariel's Sisters are two minor characters who appear in Kingdom Hearts II. They are the daughters of King Triton and the sisters of Ariel. They are two of the seven princesses of Atlantica, and apart from Ariel, the other four do not appear in the Kingdom Hearts series. To celebrate Ariel and Prince Eric's love and the newfound peace between Atlantica and the surface world, Ariel's sisters sang "A New Day is Dawning" at Sebastian's concert. 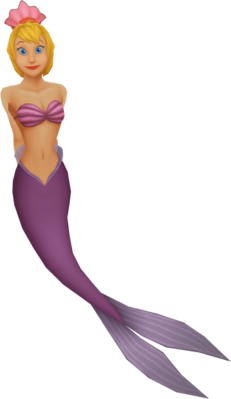 One sister is a slim, light-skinned mermaid with a purple tail. She wears a brassiere, made from purple seashells and a large pink flower in her hair. She has blonde hair, blue eyes and red lips. The other sister has a red and orange tail and wears a brassiere, made from orange seashells. She has brown hair gathered in a knot, with five red, horn-like decorations in it. She also has blue eyes and red lips. Andrina and Attina, as they are referred to within Disney canon, originate from Disney's The Little Mermaid, in which they feature as two of Ariel's six sisters. The blonde sister is Andrina and the brunette sister is Attina.